Official description Take on another seven newcomers to the Smash Bros. series! Take on another seven fighters who are newcomers to the Smash Bros. series! For Reward Clear on normal difficulty or higher. 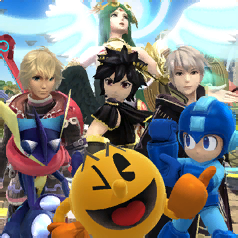 New Challengers 2 is a single-player event match in Super Smash Bros. for Wii U. The player must choose a character and take on the second set of newcomers to the Super Smash Bros. series. This event is unlocked by clearing The Break of Day. Completing the event does not unlock any additional paths. Completing the event on normal difficulty or higher awards 5000G. 1988 · A Fairy Nice Trip · A Lurking Menace · A Royal Errand · An Offering of Coins · Final Battle Team-Up · Food Fight · Flat Fracas · Full Speed Ahead · Getting Healthy · Keep 'Em off the Ship! · Mirror Magic · Peach in Peril · Poisonous Planet · Pokémon Multi Battle! · Robots vs. Dragons · Scheming Sorcerer · Secret Smash · Solidarity · Sky Pirates · The Ultimate Battle · Unlikely Allies · Viral Visitors · Visiting Onett · Wrecking Bros. This page was last edited on April 7, 2016, at 23:31.